From guesthouses to teahouses, hotels to homestays, Nepal has many different accommodation options. Our guide to the types of accommodation in Nepal will help you choose the right option for your needs and budget. After spending a collective three months exploring beautiful Nepal, from the chaos of Kathmandu to the dizzying heights of the Himalaya, all the way down to the steamy low lands of Chitwan National Park, we can safely say we've stayed in our fair share of accommodation in Nepal. Along the way, we discovered that accommodation in Nepal is super varied; from five-star safari lodges and hotels in former palaces graced by celebrities and the elite, right through to home stays with local families and the barest-of-bare backpacker accommodation. But while the accommodation options may be varied, there were many times where we found it tricky to know exactly what we were booking - teahouse? guesthouse? hostel bunk? - and often just hoped for the best when we turned up on the day! That's exactly why we've put together this guide - to help you navigate accommodation in Nepal, no matter your budget. If you’re worried about going without a bed in Nepal, don’t be - there are accommodation options literally everywhere. Established tourist centres offer the greatest variety, including Kathmandu, Pokhara and Chitwan, where you’ll find everything from glamorous 5-star to questionably basic. Up in the mountains, including Everest Base Camp and the Annapurna Circuit, you'll mostly find pretty basic teahouses and trekking lodges. Further afar, teahouses, home-stays and guesthouses exist the most off the beaten track areas. Prices vary dramatically, depending on where you stay and when. Trekking lodges can cost as little as a few dollars a night, while a safari lodge in Chitwan may set you back $250 a night. For the most part, accommodation in Nepal is extremely affordable, and the most common form of accommodation, guest houses, will charge between $5 - $35 per night. Kathmandu and Pokhara are obviously where the majority of accommodation exists, and therefore the prices can be slightly higher than other parts of the country. Teahouses and and trekking lodges in the mountains cost very little, but due to the altitude and conditions they are very rudimentary. Don't expect anything more than a wooden single bed, generally in a shared room. On the whole, accommodation in Nepal is pretty standard, and similar to what you'll find throughout Asia. Most places have a range of rooms, from budget to doubles with en-suite. It's worth noting that there's currently no regulating body for accommodation in Nepal, so we recommend reading reviews very carefully. Beware that cheaper accommodation can be of a really poor standard; if you’re backpacking, this might be okay, but otherwise, invest a few extra dollars for something nicer. The accommodation of choice (not that you have any) while trekking through the Himalaya, teahouses are generally comfortable but very basic. The key when it comes to teahouses is to remember where you are: high altitude, often extreme conditions, and in some cases, isolation from other areas of Nepal. Don’t expect much than a bed, a pillow and, if you’re lucky, a woollen blanket. Amenities are often basic, and the showers are more often than not cold (although this is changing with solar technology). While we may have painted a slightly dire picture of Nepalese teahouses, these traditional little mountain houses were our favourite type of accommodation in Nepal. Each night, we huddled around the communal fire with fellow guests, eating food, drinking tea and chatting about the incredible moments we were experiencing. Almost all accommodation is referred to as ‘guesthouse’, and there are varying levels of guesthouse in Nepal, from extreme budget to very well appointed. Guesthouses that cater to tourists are well organised: most innkeepers speak excellent English, and can arrange anything for you from laundry to trekking/porter hire (which comes in very handy). Nepal, and especially in Kathmandu, has daily power cuts (load shedding - read more in our in-depth Kathmandu guide). This often means no hot water or electricity for up to eight hours, so we recommend checking whether your guesthouse of choice has a generator for constant hot water and continuous electricity. This is probably the best option for budget backpackers, and the type of accommodation we spent most of our time in. To gain the cheapest prices, we definitely recommend doing some research on Booking.com or Hotels Combined before booking. If you're looking to splurge, especially in areas such as Kathmandu or Chitwan, there's a good range of very respectable hotels and resorts in Nepal. While not of the standard of resorts in south-east Asia or Europe, hotels and resorts in Nepal are decent enough if you do your research. Prices are far cheaper than many similar properties around the world, so if you have the budget, stay somewhere nice such as Dwarikas Resort in Kathmandu, or Meghauli Serai in Chitwan National Park. Check out the range of hotel accommodation in Nepal on HotelsCombined here. A relative newcomer to the Nepal accommodation scene, Airbnb is available across the country, ranging from swish apartments in Kathmandu (honestly, we couldn't believe our eyes at how beautiful some were), through to authentic home stays in the countryside. Obviously, Nepal is a developing country, so be mindful that the standard you expect may not be the same as Bangkok, for instance. As always, read reviews before booking. Use our Airbnb code for up to £30 off your first booking! The pinnacle of accommodation in Kathmandu, Dwarika's is a collection of former traditional heritage Nepali houses formed around a courtyard. It feels like you're stepping back in time and absolutely worth the (very) expensive cost. Oh, and the restaurant is one of Kathmandu's best. The location, right in the heart of Thamel, and cleanliness, makes Trekkers Home the best bet of budget guesthouses in Kathmandu. Lukla may be the start/end point for the Everest Base Camp trek, but it doesn't mean you need to miss out on luxury. 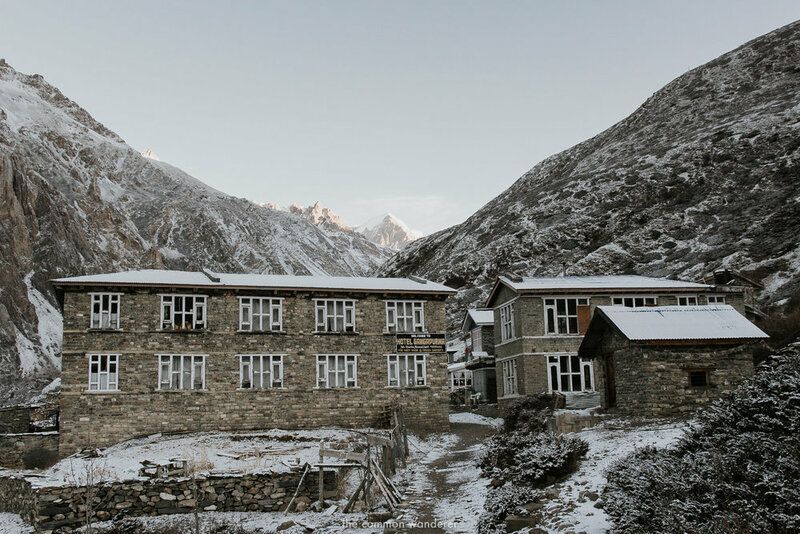 Yeti Mountain Lodge is built in traditional Khumbu style, with cosy rooms and a beautiful common area, with exceptional Nepali cuisine to boot. Highly rated due to it's clean, no-frills rooms and great restaurant and bar, Khumbu Lodge is an impressive budget alternative in Lukla. The last opportunity to enjoy creature comforts on the Everest Base Camp trek, Yeti Mountain Home is the perfect luxury option in the mountains. Rooms are equipped with heated beds and an en-suite, while the common area is the ONLY place to hang out after a day of hiking (remember to grab some popcorn). The restaurant serves wonderful Nepali cuisine. A great budget option right in the heart of Namche. Rooms are comfortable, with an attached toilet, although shower facilities are shared (hot water is available at an additional cost). Shared shower room available at the hotel. Standard room includes of a toilet only. Separate shower rooms are available on each level. Hot water facility is available at an additional cost. Located on the scenic Phewa Lake, 15 minutes walk from Pokhara, Waterfront is an amazing oasis, perfect to relax in after hiking the Annapurna Circuit. Spacious air-conditioned rooms are equipped with ensuite and cable TV, while the outdoor pool is a great place to spend hours in the lovely sun. Hostels aren't really a thing in Nepal, however, Aroma Tourist Hostel is the perfect place to meet fellow backpackers from around the world in a relaxed environment. Rooms range from dormitories to doubles, and you can also pitch your tent here. Inspired by the villas of Bali, Kasara Resort is an oasis on the borders of the UNESCO heritage Chitwan National Park. The rooms are to die for and the location is peaceful - the perfect place to relax after a day on safari searching for Tigers and Rhinos, while the pool area is absolutely stunning. Basic, but in the best way, Evergreen Eco Lodge is the perfect chill out accommodation for backpackers wanting to explore Chitwan and surrounds. Probably the coolest thing about this property is the dorm located in a former bus, called the 'Friendship Bus'. Otherwise, wooden huts and cottages are the options. We highly recommend this property due to its eco mindset and low environmental impact. During our travels in Nepal, we used a number of different accommodation booking portals, including Booking.com and Hotels Combined. In our opinion, Booking.com had the largest range of options, and prices were generally cheaper than advertised directly, however Hotels Combined is a newer system, so is worth utilising. We recommend reading reviews before booking, as there is nothing worse than booking a hotel only to find they have bed bugs. We generally book based on a combination of price and reviews, and never settle for accommodation with less than a 7 rating. If you're hiking and booking teahouses directly or on the spot, we recommend checking the facilities first before booking a room. Look out for cleanliness, the vibe, electricity for charging, hot water (or the potential for a hot shower), and other inclusions including breakfast/dinner. We also absolutely disagree with haggling for a cheaper price in Himalayan teahouses - as a tourist in the Himalayan region we have the obligation to help the local community improve its quality of life through our tourism dollars. Have you stayed in Nepal? How did you find the accommodation? And if you're planning to visit Nepal, was this guide helpful? Let us know in the comments!